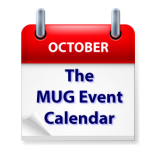 Though short on entries, this week’s MUG Event Calendar is long on named presenters. Adam Christianson will talk iOS and iPhone 6 with one California group, Allison Sheridan will take her digital disaster presentation to another California group, and Parallels will make a visit to an Australian group. Other topics include investment tools, the new iPhones, an NSCoders night, and more.